Fiery dragons, reanimated bodies, mysterious ruins--medieval history writing is full of fantastical and fabulous stories. To later readers, it often seems like medieval history is more like fiction than reality. 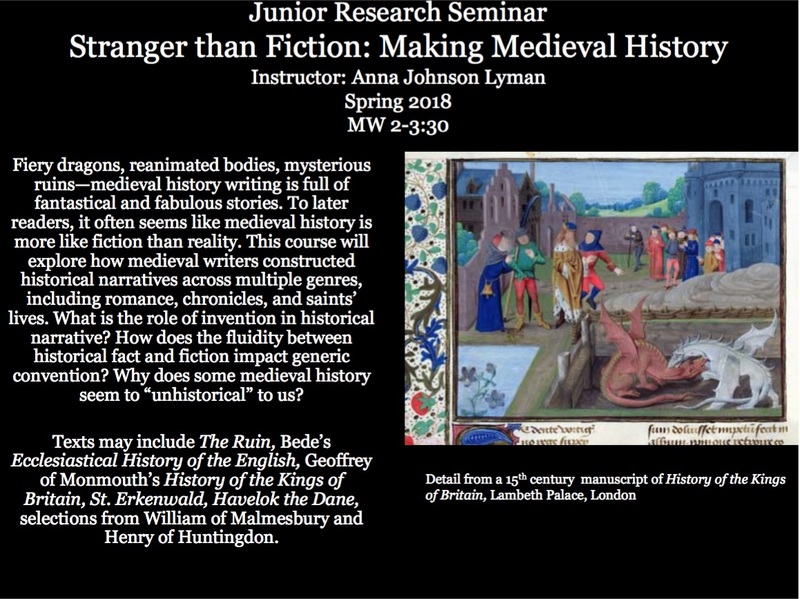 This course will explore how medieval authors constructed historical narratives across multiple genres, including romance, chronicles, and saints' lives. What is the role of invention in historical narrative? How does the fluidity between historical fact and historical imagination impact generic convention? Why does some medieval history seem so "un-historical" to us? We will read a wide range of texts across genres, including, but not limited to The Ruin (c. 8th or 9th c.), Bede's Ecclesiastical History of the English (c. 731), Geoffrey of Monmouth's History of the Kings of Britain (c. 1136), St. Erkenwald (c. 1386), Havelok the Dane (late 13th century), and excerpts from the twelfth century historians William of Malmesbury and Henry of Huntingdon. Works originally in Latin or Old English will be read in translation (although students are welcome to bring any prior experience of the languages to their own research and analysis). Middle English works will be read in the original language, although no prior knowledge is assumed. For this version of English 200, requirements include short writing assignments, an editing exercise, a linguistic exercise, and a short presentation, culminating in a research project at the end of the semester.